Walking around Hollywood was surprisingly calm, even the week before the Oscars. I guess being an east coaster, I kinda equate large metropolitan areas with raging torrents of focused people. Yet Hollywood showed me a lovely day of easy parking, serendipitous sidewalks and pleasant people. To stretch my legs and enjoy a (hopefully) good cup of coffee, I stopped at a local Groundworks. The coffee establishment has numerous locations in the greater LA area and has a close to 20 year legacy, so when I got a recommendation to stop in I figured it a good opportunity. The Hollywood location sits on the corner of N. Cahuenga and Sunset, a light brick building with lovely tan awnings and shiny outside seating. The inner cavity displayed a cafe of decent size with a good amount of seating, including a large viking-size banquet table complete with benches. They roast their own coffee at Groundwork, and they seem to brew half of their offerings each day as there were 8 pump pots of coffee to choose from. I began pumping their Peru when it ran out after two pumps, but not wanting to just chuck it, I figured I'd give it a sample; it proved bright and very floral, with some hints of berry. Then I had their Brazil, a darker blend that held little distinction; just char and a moderate smooth texture. To note, they also had pour overs towards the back but they didn't seem to be used much. The espresso gave a good showing, as it was pulled short, had decent crema and had a lemony tang up front complimented with a good body and only a small bit of char on the end. The tea is free leaf. After a good deal of leg stretching and coffee, I moseyed out onto the civil streets of Hollywood a refreshed man. 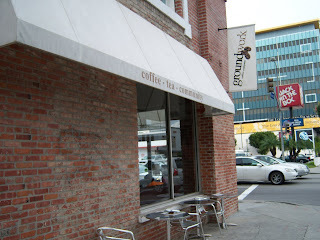 My overall impression of Groundwork was of a decent cafe with a few minor areas to further streamline. If you're in town, treat yourself to some Groundwork.